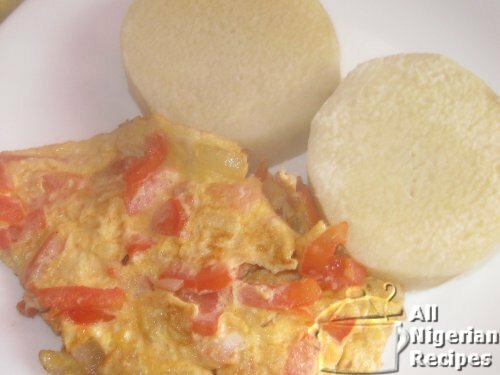 Boiled yam can be eaten with Garden Egg Stew (the best combo), Beef and Chicken Stew, Corned Beef Stew, Pepper Sauce, Egg Stew, Fried Egg or Tomato Omelette. Cut the yam tuber into 1 inch slices. Peel and cut the slices into half moons. You can leave it circular if you want. This does not make a difference to the recipe at all. Wash the slices, place in a pot and pour water to cover the contents. Boil till the yam is soft. This is when you can easily drive a fork into the slices without resistance. Add salt and leave to cook for about 2 minutes. This is so that the salt will seep into the yam slices. Serve with Garden Egg Stew (the best combo), Beef and Chicken Stew, Corned Beef Stew, Pepper Sauce, Egg Stew, Fried Egg or Tomato Omelette.